Despite Hamas claims, newly found terror tunnel contains vital equipment, has allegedly been used recently. Senior IDF sources confirmed to Arutz Sheva Friday that the Hamas terror tunnel making its way through the media is not only new - contrary to Hamas's claims - but highly advanced. "The tunnel exposed this week is the longest and most elaborate revealed to date," the official stated. "We found tools, generators and additional equipment which indicates that it was being used in the past several days." "Hamas," he continued, "is building these tunnels to kidnap and kill [IDF soldiers], because only then do they think they can get [Israel] to release more [terrorist] prisoners." A different official spoke to Channel 10 Friday about the tunnel, noting its quality and apparent age. "It seems that the tunnel was dug over several months and years," the officer told the Israeli daily. "From the tools here, we estimate it was being used until just a few days ago." "The tunnel is 9 meters deep, and reaches 20 meters at some parts," he continued. "Slackers did not dig this terror tunnel; this is more professional, made for a highly effective, easy attack [on the IDF]." The official also noted that the tunnel itself extended hundreds of meters into Israel. On Thursday, the IDF uncovered the tunnel; Hamas fired back, claiming it was "old" and "a false achievement" for Israel. The IDF released a statement Friday morning noting that, old or not, the tunnel is a terror tunnel - and a violation of conditions set with Hamas during Operation Pillar of Defense. 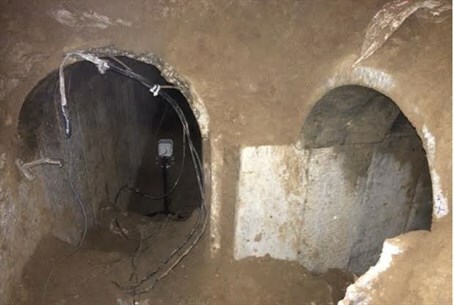 "The IDF will continue to act with determination to locate all Hamas terror tunnels through accumulated expertise and capabilities," the IDF stated. "The IDF sees the terror tunnel as harming Israel's sovereignty and a flagrant violation of understandings met during Operation Pillar of Defense."